We had previously wandered past The New Black on a meander to see what was new in Fortitude Valley’s laneways. We had not had room for more than coffee that time, but were intrigued by the menu, and planned a return for a meal. Near the entrance to Bakery Lane, it is unassuming from the outside. The name of the eatery is printed in white on the glass above the window if you look up and catch it at just the right angle so you avoid the glare from reflected light. “The New Black” expresses its aspiration to super-popularity, as well as a reference to its origins, the Black Lab Coffee Company. 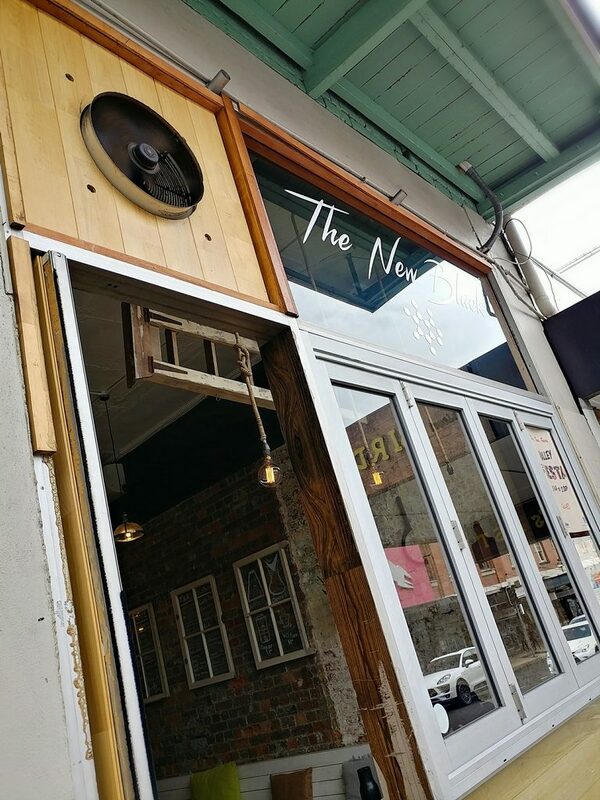 The entrance to The New Black. You have to look up to confirm that this is the place..
Once through the door, we found ourselves in a space that was a mix of industrial and art nouveau styling. 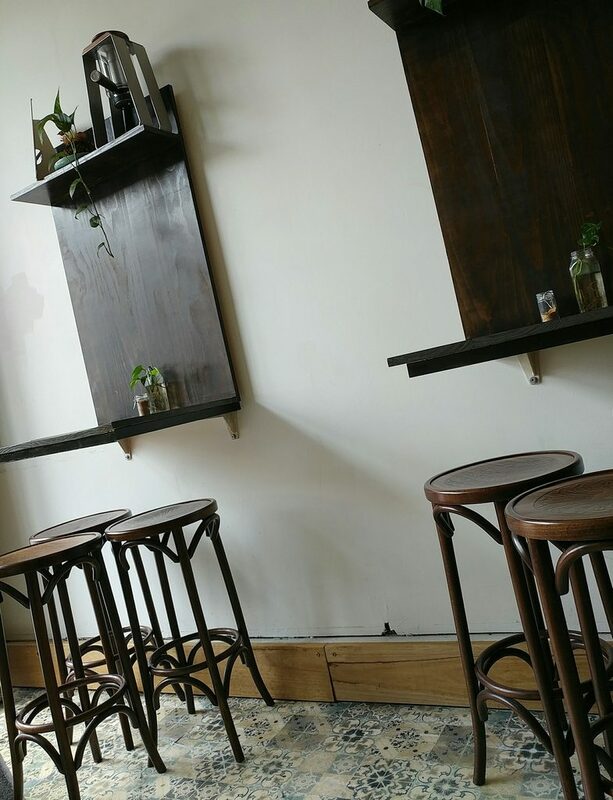 The eatery has quite a compact footprint, with about five tables that fit two against a white wooden booth seat that runs along one wall, and three almost alter-like arrangements along the other wall that function as bar-height tables. They have used patterns and the contrast of dark and light well. The floor has blue, white, and grey floor tiles with ornamental patterns on them, which brighten the space, as well as making them a decorative point of interest in themselves. 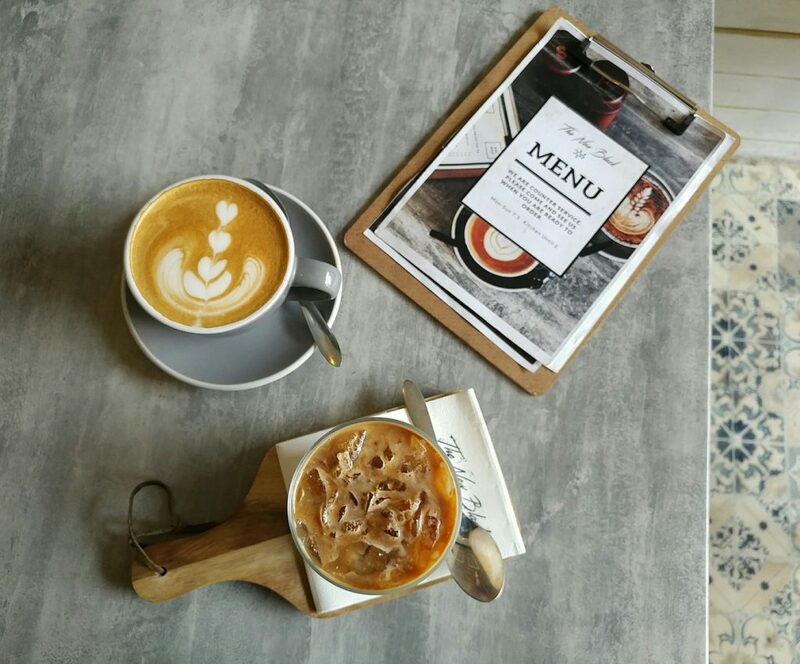 The dark wood furniture is a crisp contrast to the white wall on one side of the eatery, and the white pressed tin ceiling high above, which is also patterned. More textural notes come into play, with exposed raw brick on the opposite wall, and the polymer tabletops that look like streaked concrete. 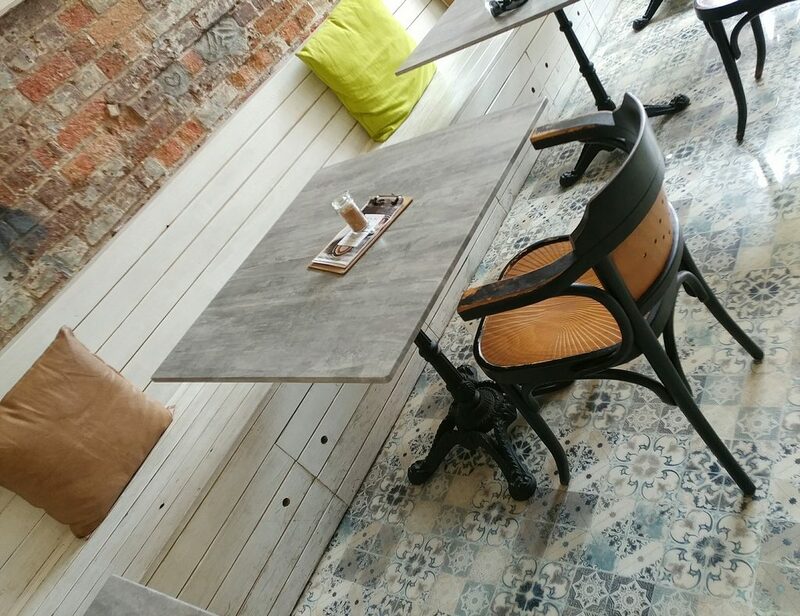 The stylish seats and pretty floors at The New Black. 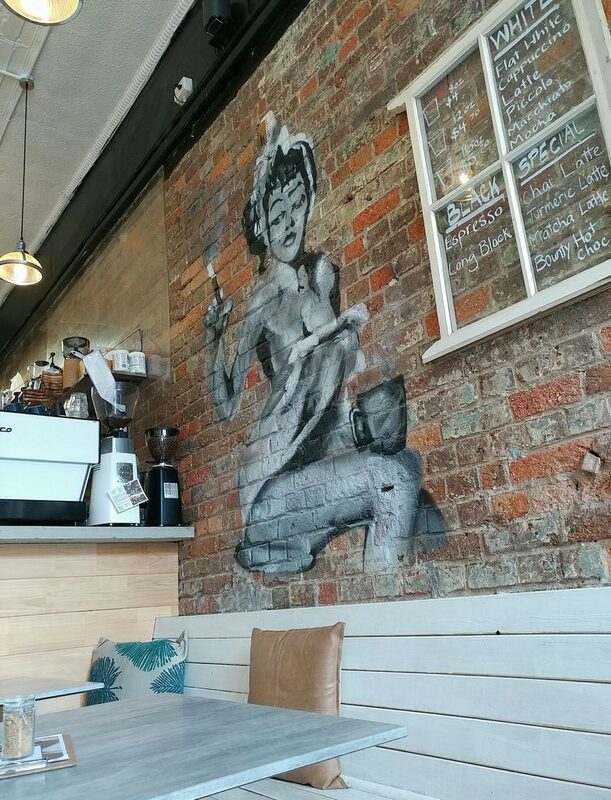 Further features of interest are the salvaged glass windows suspended on the brick wall with drink options written on the glass in white, and the black and white mural of a woman, possibly having a chilled out afternoon at home. The mural on one wall. Traffic noise from outside came through the open door, a frequent rumble of cars and whine of scooters from the busy Ann Street. Disco groove played over the speakers, creating a light and lively feel to counter it. There was a small extraction fan above the door, but ventilation largely relied on passive air movement through the door. We did note that there was an air conditioner for when the weather turned hot though. The counters along the wall. Menus sit at the tables, sheets held together by clipboards, so they can easily change things around. Funnily enough, the front of the menu is self-referential, with a picture of the menu and coffees on the table. There are also clear instructions on that first sheet, telling patrons that it is counter service, so they should go to the counter when they are ready to order. 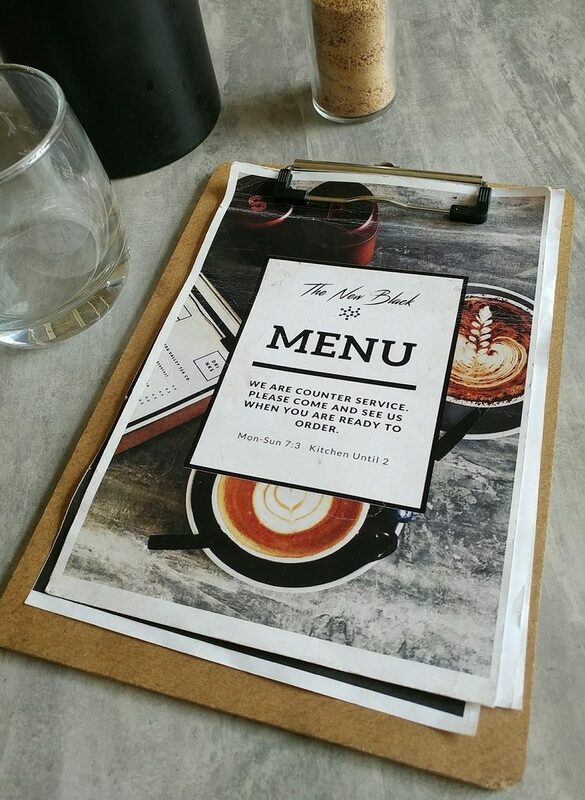 The menu on the table, with a picture of a menu on the table.. They do changing specials on the weekend, but unfortunately the one that had caught our eye had already sold out. We eventually settled for a couple of options off their regular menu, the Cheeseburger Toastie, and the Baked Beans. 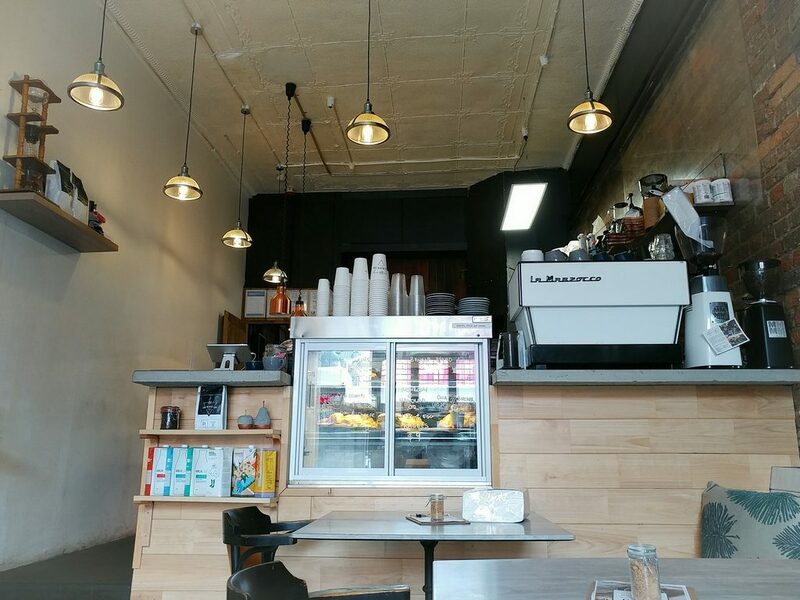 We placed our food and coffee orders at the service counter, which sits raised above the seating area by few steps’ height. There are also a few lighter food options in a glass cabinet at the front of the counter, like filled bagels and croissants, for those who aren’t that hungry. The service counter, raised above the rest of the space. 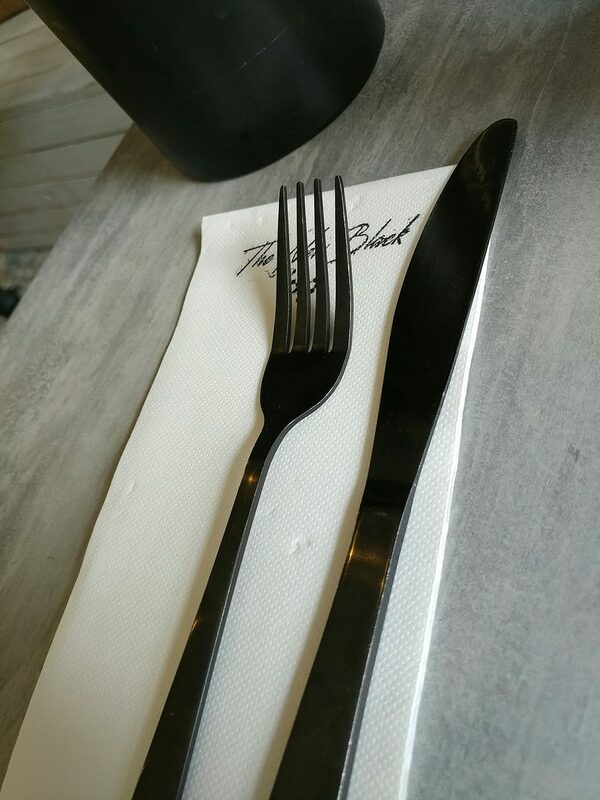 Cutlery was brought to the table, and in keeping with “The New Black”, the cutlery was a matte black, as was the the water jug. Coffees arrived first. The flat white had a good microfoam texture. It was not as flavourful as hoped though. At another angle, to show the latte art. 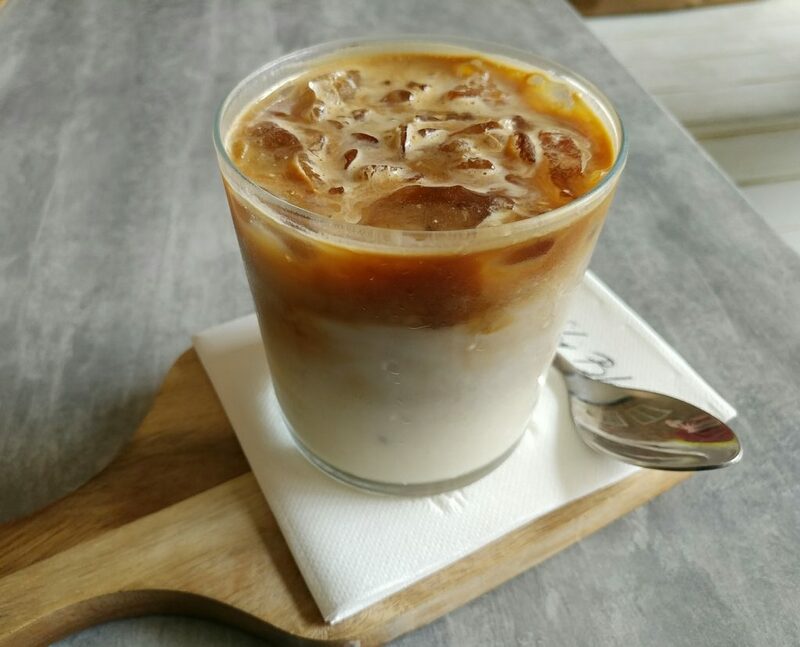 The iced latte was presented on a wooden serving board. It made for a good picture..but the handle of the board took up extra space on a not large table that later also had to fit two dishes, along with the water glasses, jug, and salt and pepper shakers (and the other coffee). The iced latte was a better strength than the flat white, and had fruity notes. It didn’t have the prefered nutty and chocolatey flavours though, and was a little bitter in the finish. 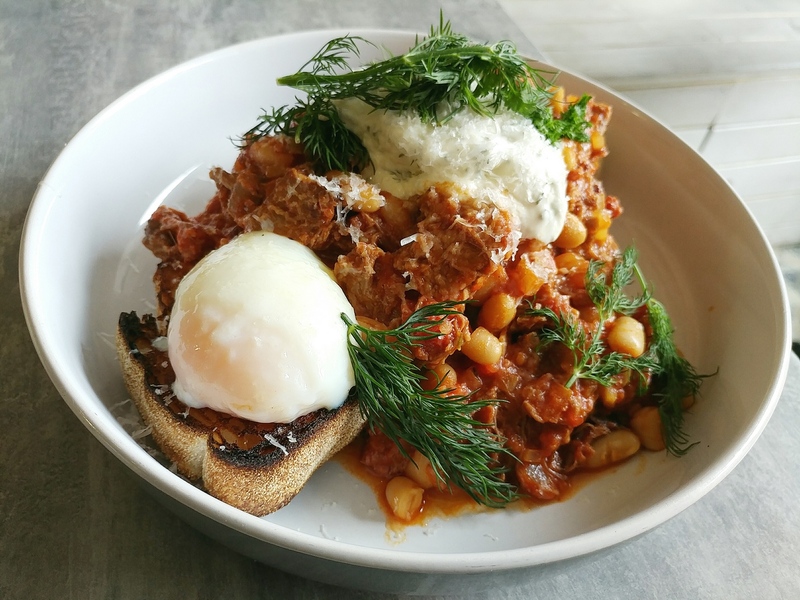 The Baked Beans dish was listed in the menu as being composed of harissa, white beans, charred brisket ends, chorizo, herbed sour cream, parmesan, thick cut sourdough, and a slow egg. 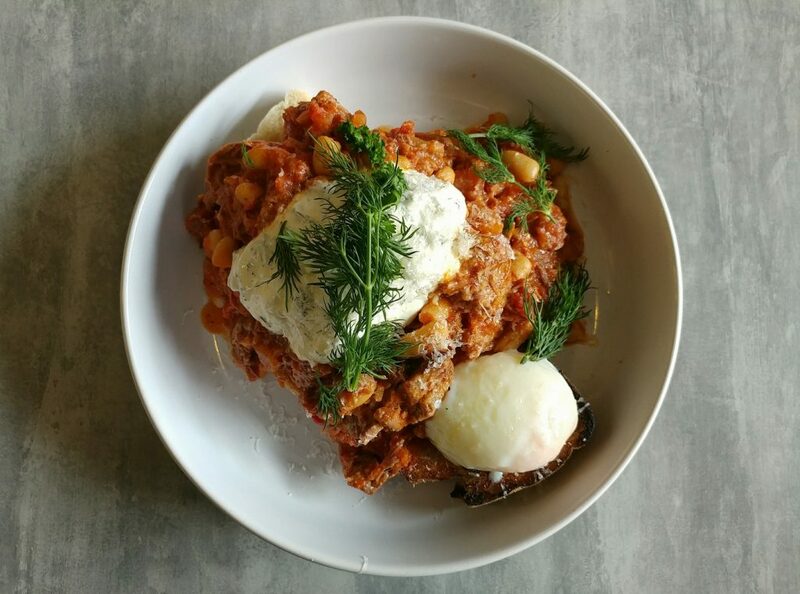 It smelled strongly of the fresh dill topping it, and the poached egg had a promising wobble as the dish was placed on the table. The baked beans and pulled meat mix was heaped on the sourdough slice. It was a generous and not just token amount, and we found it to be a hearty, meaty mix, rather than being just tomatoey slop. The pulled brisket meat was tender, but still retained its texture. The thick cut sourdough bread making the base had a soft chew, with a toasty crunch at the edges. Because the baked bean mix on it was not runny, the bread didn’t get soggy. There was a good dollop of herbed sour cream on top, which gave it some contrasting bright flavour, and creaminess. 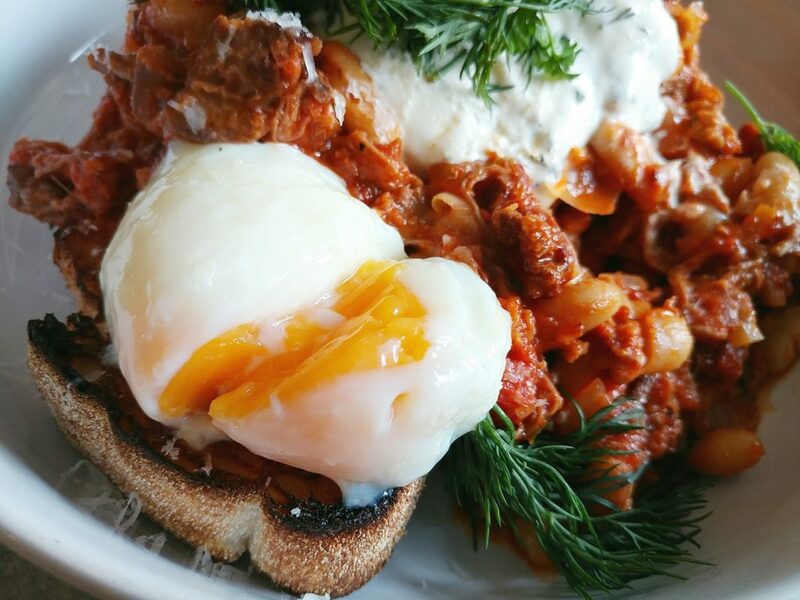 That wobbly poached egg was soft and had a runny yolk. We don’t usually order the Baked bean dish on a menu, but we were hungry and wanted something substantial. We weren’t disappointed, and found this to be a hearty winter dish with some nuance to it, so it wasn’t just meat and beans. 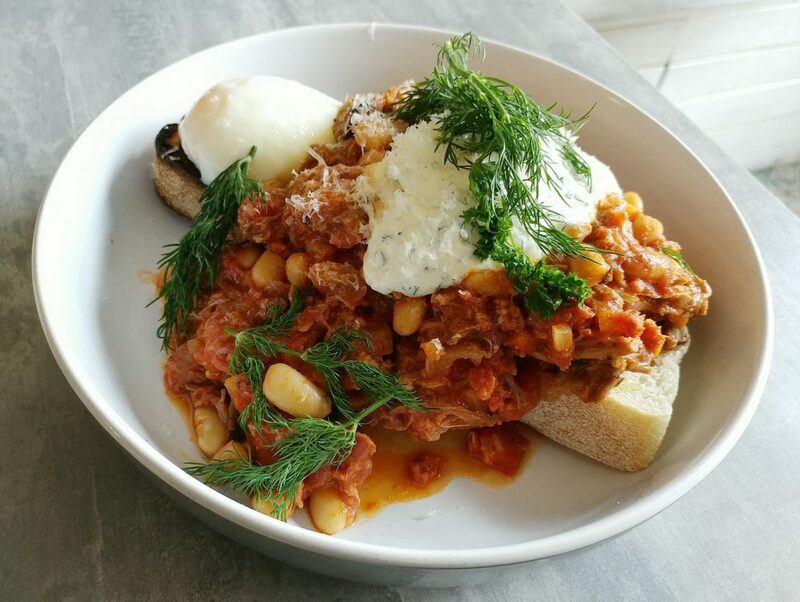 The Baked Beans dish, with harissa, white beans, charred brisket ends, chorizo, herbed sour cream, thick cut sourdough, and a slow egg. The Baked Beans dish, showing the generous tumble of the meat and beans mix. The dish from the other side. A glimpse of the soft yolk of the slow egg. 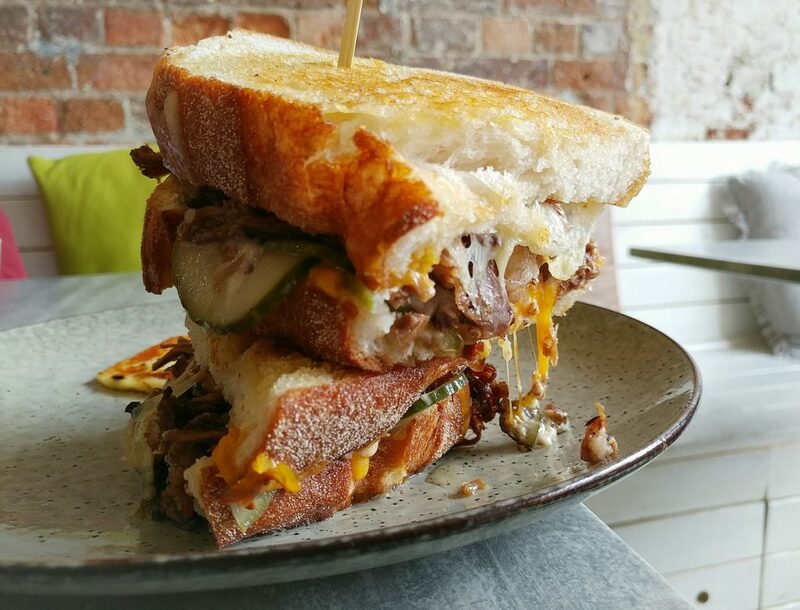 The Cheeseburger Toastie had brisket, American cheddar, Swiss cheese, special sauce, pickles, thick cut sourdough, and usually comes with buttermilk onion rings. As one of us doesn’t particularly like onion rings, we swapped them out for haloumi instead. The plate arrived with two halves of the sandwich staked together like a club sandwich. 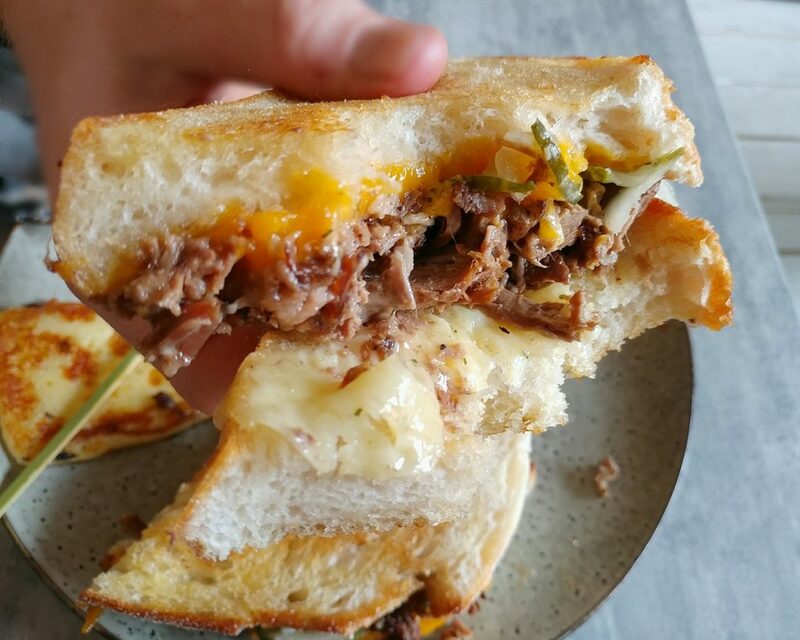 From the side, we could see the melted cheese oozing, stretchy strands cushioning a couple of the components doing a slow-motion fall from inside the sandwich. The thick cut sourdough slices were buttered and toasted, so they were crisp on their outer surfaces, and soft on the inside. The brisket meat had a smokey flavour, and was seasoned well. The chunks of meat were cooked to that happy medium between being too squishy and being too dry. Little pickle slices gave the mix tanginess and crispness. The melted cheeses melded with the other ingredients, and tied them together well. It wasn’t fancy food, but it was tasty. The haloumi pieces were nicely cooked as well, but for those who have no opposition to onion rings, their original combination probably works better. 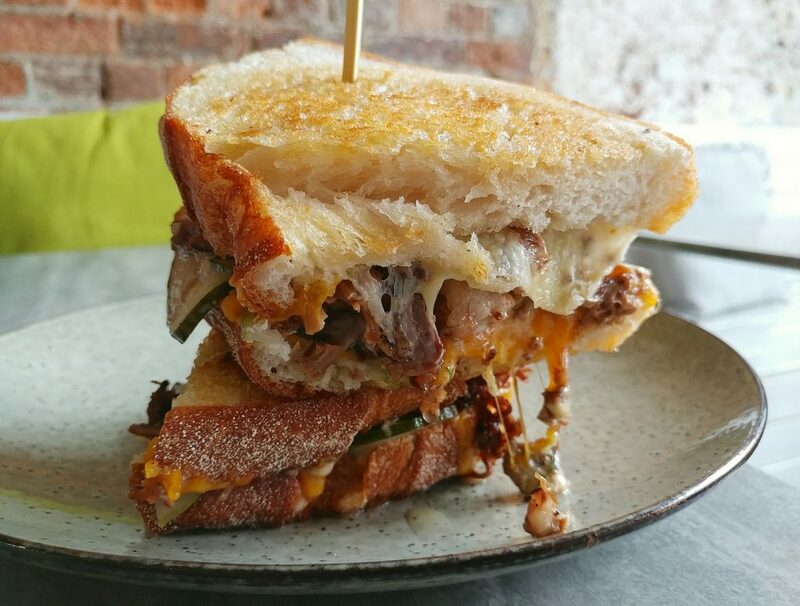 The Cheeseburger Toastie, with brisket, American cheddar, Swiss cheese, pickles, and thick cut sourdough. Buttermilk onion rings swapped for haloumi. The Cheeseburger Toastie from a more appetising angle. Another look. 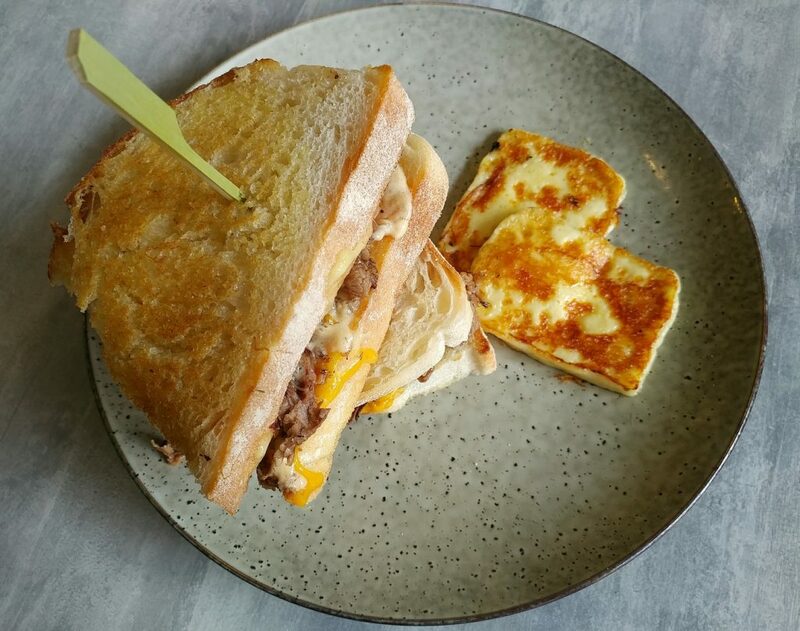 Check out the cheese melt..
A look inside the sandwich. The New Black does considered, clever takes on what could otherwise be quite ordinary dishes. The food was tasty, and the serving sizes good for hungry people. 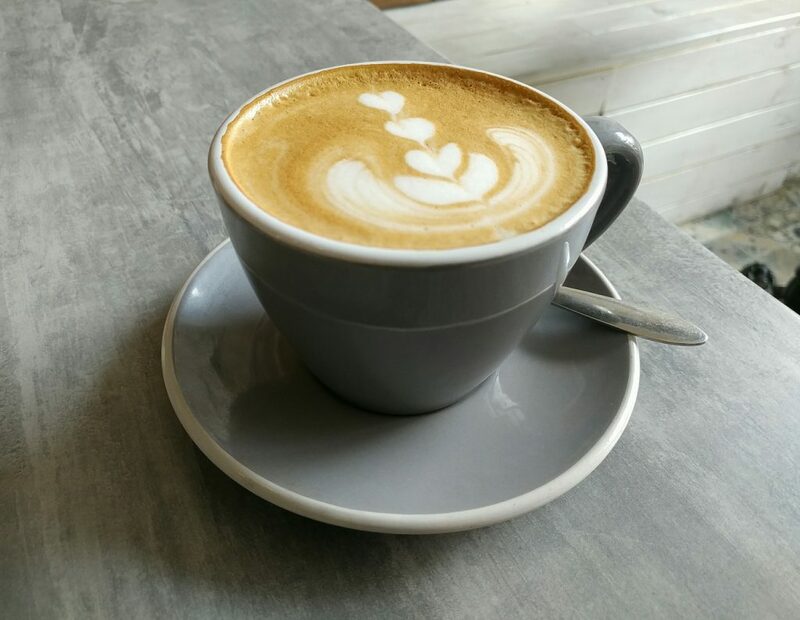 We were a little surprised that the coffee wasn’t better though, given that it is a venture from what is primarily a coffee roastery. The decor is different from what is more commonly being done, but its own quirky cool, and it is a nice spot to stop. 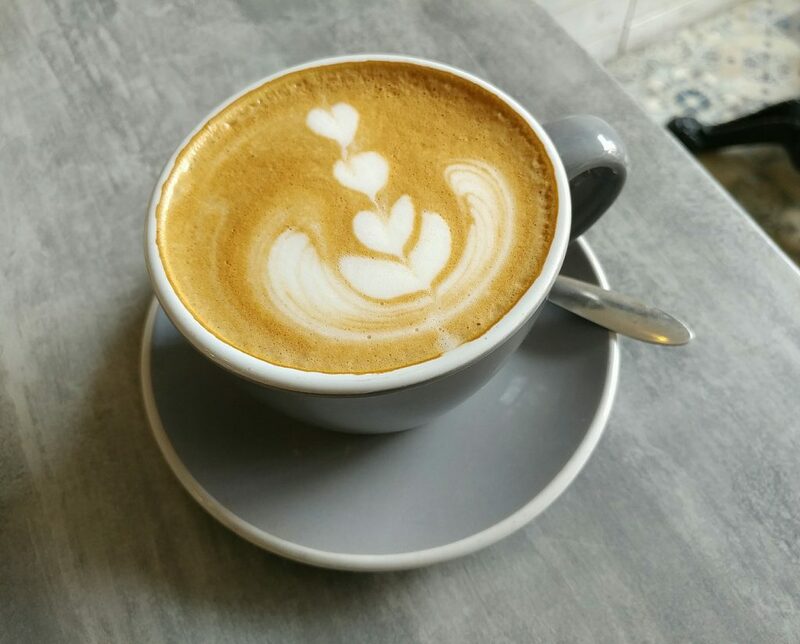 Keep an eye out for their weekend specials, and get there before they sell out..
A look at the coffees again. The setting makes for good pictures. 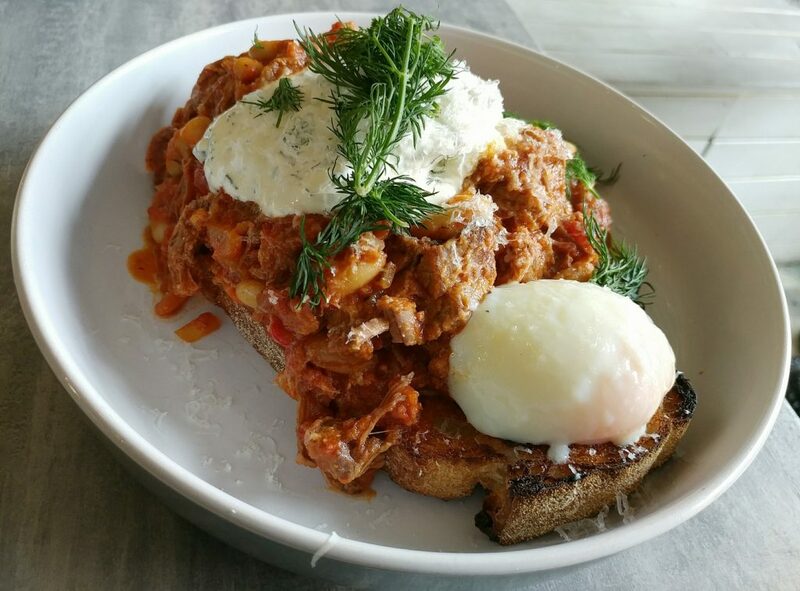 Price point: $16 to $25 for things more substantial than spreads on toast or pastries. The dishes we had, $20 each. Value: Alright, for what you get.